Elizabeth Fongemie, Business Development and Marketing Associate for the School’s Professional Education program (left), and Caitlin Krouse, Director of Alumni Relations (right). 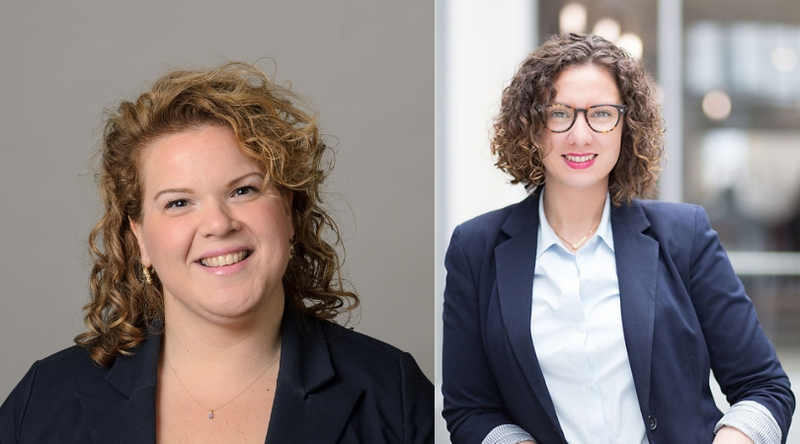 The University of Connecticut School of Engineering is proud to announce the addition of Caitlin Krouse as Director of Alumni Relations, and Elizabeth Fongemie as Business Development and Marketing Associate for the School’s Professional Education program. Krouse has nearly a decade of alumni relations experience in higher education, most recently as Manager of Alumni and Parent Relations at The Warren Alpert Medical School of Brown University, and will be replacing the retiring Heidi Douglas, who has held the role for nearly nine years. Prior to Brown, Krouse held roles at Roger Williams University and the University of Massachusetts Medical School. Krouse is an alumna of UConn, and graduated with a bachelor’s degree in journalism in 2009. Fongemie has had a robust career in marketing, business development and corporate partnerships, spending over 15 years at PME Enterprises, a sales and marketing agency specializing in conferences, events and expositions, ending her tenure as Senior Vice President. Most recently, she served as Philanthropy Director at the American Red Cross, focused on corporate partnerships throughout Connecticut and Rhode Island, working in tandem with businesses to achieve their marketing, branding and employee engagement goals, all while raising funds to support the organization’s mission.Fongemie received her bachelor’s degree in communications and public relations from Regis College in 1998. For more information on our alumni and professional education programs, please visit engr.uconn.edu.